BD Building are licensed builders who specialise in Timber Decking. Using only skilled, licensed tradesmen and a comprehensive decking installation procedure developed to give your new Timber Decking Strength, Beauty, Longevity & Termite Protection. 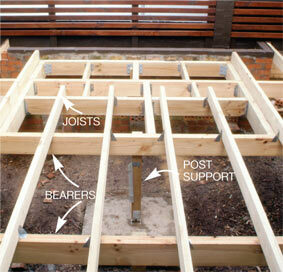 To save time most builders / carpenters will use a nail gun to secure the timber decking planks to the joists. Our tradesmen use screws so that when the timber swells and contracts, as all timber does, the screws will keep your decking in place without you having to re-hammer nails which have been displaced as a result of the timber moving. Using screws also binds the entire decking structure together much more securely adding to its longevity and reducing the amount of future maintenance. Regardless of where you live in Sydney you are in ‘Termite Country”, and termites LOVE timber. With that in mind BD Building will build your deck with a number of Anti-Termite features which should discourage even the most enthusiastic termite species found in the Sydney area. BD Building use a wide variety of Australian native timber, recycled timber and selected imported timbers from accredited suppliers. This allows us to give you the widest possible selection of grains, colours & finishes. For an obligation FREE QUOTE Contact Brad at BD Building & Construction on (0425) 333 590. Sydney, Centennial Park, Wahroonga, Marrickville,Abbotsbury, Milsons Point, St Ives, Padstow Heights, Moorebank, Winston Hills, Potts Hill, Picnic Point, Oatlands, Drummoyne, Queens Park, East Ryde, Henley, Middle Cove, Dawes Point, Fairfield, Lewisham, Camperdown, Woolooware, Bass Hill, Canterbury, Bondi Junction, Bexley North, Canada Bay, Kearns, Dundas, Holsworthy, Kyeemagh, Waverton, Austral, Old Guildford, Maroubra Junction, Hammondville, Denistone, Belmore South, Ingleside, McMahons Point, Bellevue Hill, Campbelltown, Doonside, Allawah, Lansdowne, North Ryde, Windsor, East Sydney, Milperra, Hurstville Grove, Blackett, Mays Hill, West Killara, Garden Island, Homebush, Malabar, Villawood, Maraylya, Colebee, Duffys Forest, Lucas Heights, Carramar, Arcadia, Audley, Melrose Park, East Hills, Hoxton Park, Banksmeadow, Kingswood, Mount Annan, Sans Souci, Mosman, Lurnea, Wingala, Zetland, Raby, Kurnell, Birchgrove, Lidcombe, Lansvale, Randwick, Yennora, Dunheved, Wakely, The Rocks, Strawberry Hills, Gordon, Bondi Beach, Strathfield, Luddenham, Narrabeen, Punchbowl, Ashbury, Killarney Heights, South Penrith, Carnes Hill, Cockatoo Island, Airds, Round Corner, Harbord, Clareville, Rockdale, Bondi, Pendle Hill, Dundas Valley, North Bondi, Bringelly, Liverpool, Balgowlah, Wallacia, Cottage Point, Arncliffe, Bexley, Old Toongabbie, Cromer, Sadleir, East Killara, Auburn, Croydon Park, Roseville Chase, Menangle Park, Girraween, Dolans Bay, Roseville, Barra Brui, St Clair, Parklea, Glebe Point, Wiley Park, Daceyville, Lilli Pilli, Glenmore Park, Mount Druitt, Careel Bay, Darling Point, Condell Park, Castlereagh, Chiswick, North Balgowlah, Berkshire Park, Annangrove, St Peters, North Parramatta, West Pymble, Lane Cove, Ashfield, Glenorie, Bobbin Head, Gladesville, Georges Hall, Croydon, Taren Point, Redfern, Willmot, Longueville, Llandilo, Haymarket, Cremorne, Marsden Park, Hornsby Heights, Kogarah, Elizabeth Bay, Warringah Mall, Beverly Hills, Belrose, Dolls Point, Vaucluse, Gymea, Pymble, Concord, Botany, North Rocks, Eschol Park, Glossodia, Neutral Bay, Curl Curl, Forest Lodge, Rosehill, Bidwill, Greenfield Park, Werrington County, Sandringham, Cartwright, Regentville, West Ryde, Flemington, Grays Point, St Ives Chase, Woronora, South Turramurra, Cheltenham, Camden South, Pendle Hill South, Horsley Park, Baulkham Hills, Carlingford, Lilyfield, Yagoona, Mascot, Artarmon, Enmore, Kingsford, Berala, Menai, Huntleys Point, Banksia, Chippendale, Mount Pleasant, Elanora Heights, Oyster Bay, Blakehurst, Northwood, Werrington Downs, Newington, Kellyville, North Seaforth, Bonnyrigg, Double Bay, Sylvania, Dobroyd Point, Hornsby, Emu Plains, Woolloomooloo, South Granville, Box Hill, Kirrawee, South Strathfield, Glebe, Port Hacking, Watsons Bay, Five Dock, Little Bay, Kirribilli, Warragamba, Arndell Park, Homebush West, La Perouse, North Strathfiled, Sydney, Cowan, Kogarah Bay, Church Point, Pleasure Point, McGraths Hill, Avalon, Warriewood, Hassall Grove, Cronulla, Eveleigh, Palm Beach, Westleigh, Gore Hill, Eastwood, Annandale, Cambridge Park, Clareville Beach, Heckenberg, Bossley Park, Riverview, Waitara, Macquarie Park, Vineyard, Bardwell Park, Oakville, Castle Hill, North Epping, Woolwich, Turella, East Balmain, Rozelle, Shanes Park, Lakemba, Davidson, Wentworthville, Erskine Park, Kings Park, Connells Point, Padstow, Bundeena, Barden Ridge, Telopea, Paddington, Enfield, Bligh Park, Revesby Heights, Warrawee, Acacia Gardens, Marsfield, Parramatta, Mount Lewis, Elderslie, Como, Phillip Bay, Roselands, Lemongrove, North Sydney, West Hoxton, Spring Farm, Glenfield, Moore Park, St Marys, Bradbury, Colyton, Crows Nest, Sutherland, Heathcote, Asquith, Clyde, Darling Harbour, Earlwood, Rhodes, Leonay, Illawong, Maianbar, Claremont Meadows, Coogee, Thornleigh, Kingsgrove, Erskineville, Spit, Fairfield Heights, Rosemeadow, Alfords Point, Goat Island, Sylvania Waters, Oxley Park, Castle Cove, Rodd Point, Marrickville South, Dangar Island, Wetherill Park, Seaforth, Bow Bowing, Abbotsford, Darlington, Harris Park, East Botany, Forestville, Engadine, Dulwich Hill, Chatswood West, Kyle Bay, Rossmore, Penshurst, Mount Vernon, Jannali, Narellan, Prospect, Bilgola, West Pennant Hills, Anzac Village, Jamisontown, Wheeler Heights, Prestons, Brighton-le-Sands, Northbridge, Tempe, Chester Hill, Denistone East, Manly Vale, Tamarama, Voyager Point, Cambridge Gardens, Epping, Lalor Park, Beaumont Hills, North Turramurra, South Wentworthville, Cammeray, Balmain, Lindfield, Sandy Point, Hunters Hill, Beacon Hill, Bilgola Plateau, Woollahra, Surry Hills, Brookvale, Georges Heights, Whalan, Balmoral, Mount Kuring-Gai, Rooty Hill, North Manly, Alexandria, Strathfield West, Pagewood, Minto, Revesby, Cabarita, Sefton, Bronte, Camellia, Dee Why, Eastlakes, Toongabbie, Miranda, Clontarf, Waterloo, St Johns Park, Campsie, Ambarvale, Clovelly, Bayview, Dean Park, Chipping Norton, Riverwood, Varroville, Point Piper, Camden, Allambie, East Wahroonga, Lavender Bay, Blairmount, Mount Colah, Cremorne Point, Collaroy Plateau, Nelson, Hebersham, Cabramatta, Woronora Heights, Collaroy, Meadowbank, Belfield, Badgerys Creek, Russell Lea, Homebush Bay, Oatley, Mortlake, North Cronulla, Killara, Busby, Emu Heights, Kareela, Miller, Bankstown, Narellan Vale, Loftus, Mortdale, Newport, Edmondson Park, Roseville, Huntingwood, Turramurra, St Leonards, Chatswood, Caringbah, Dharruk, Kenthurst, Pennant Hills, Guildford, Belmore, Ramsgate, Boronia Park, Miller Point, Bonnet Bay, Regents Park, Newtown, Bella Vista, Ultimo, Granville, Rydalmere, Pyrmont, Monterey, Lethbridge Park, Peakhurst, Castlecrag, Leichhardt, Sydenham, North Engadine, Circular Quay, Cabramatta West, Northmead, Richmond, Waverley, Plumpton, Tennyson, Birkenhead Point, Green Valley, Rushcutters Bay, Panania, East Lindfield, Riverstone, Hurlstone Park, Marayong, Scotland Island, Potts Point, Birrong, Mulgrave, Middle Dural, Smithfield, Canley Vale, Broadway, Pitt Town, Summer Hill, Casula, Baulkham Hills West, Scheyville, Greenwich, Petersham, Ashcroft, Rose Bay, Putney, Frenchs Forest, Wattle Grove, Greenacre, Darlinghurst, Quarry Hill, Kemps Creek, Westmead, Bangor, Hurstville, Spit Junction, Waterfall, Ryde, Wilberforce, Yarrawarrah, Gymea Bay, Silverwater, Greystanes, Willoughby, Beaconsfield, Linley Point, Terrey Hills, Chullora, Matraville, Haberfield, Rose Bay, Lugarno, Yowie Bay, Chifley, Normanhurst, Rookwood, Ermington, Beauty Point, Glen Alpine, Kangaroo Point, Edgecliff, Kensington, South Hurstville, Carss Park, Beecroft, Kings Cross, Fairfield West, Concord West, Stanmore, Dover Heights, Prairiewood, Maroubra, Hillsdale, Quakers Hill, Warwick Farm, Cecil Park, Brooklyn, Narwee, Kings Langley, West Lindfield, Burwood, BCarlton, Woodpark, Burraneer Bay, Wollstonecraft, North St Ives, Edensor Park, Mount Pritchard, Oakhurst, Cherrybrook, Canley Heights, Glenwood, Denham Court, Beverly Park, Chatham Village, Seven Hills.